Fluoride: Where Does It Come From? What Does It Do? Fluoride comes from fluorine, an elemental gas that Webster’s describes as pale, yellowish, flammable, irritating, and toxic. Fluorine is the active ingredient in Sarin (the nerve gas used to deadly effect in a March 1995 Tokyo subway attack) and in Flusilazole (a fungicide that, in the early ’90s, caused crop damage and human ailments in 40 states). NIOSH noted that elemental fluorine is also used “in the conversion of uranium tetrafluoride to uranium hexafluoride, in the synthesis of organic and inorganic fluorine compounds and as an oxidizer in rocket fuel.” Today, compounds made with this chemical can be found in everyday products ranging from Teflon and Freon to toothpaste and baby food. Fluorides are industrial waste products created in the production of aluminum, phosphoric acid and phosphate fertilizers. Some 55 years after DuPont began producing uranium hexafluoride for the Manhattan Project, the company still heavily invests in fluorine. DuPont uses it to make a number of consumer products, including Tedlar polyvinyl fluoride film and Viton fluorocarbon rubber. Hydrofluosilicic acid is the most corrosive chemical agent known to man. 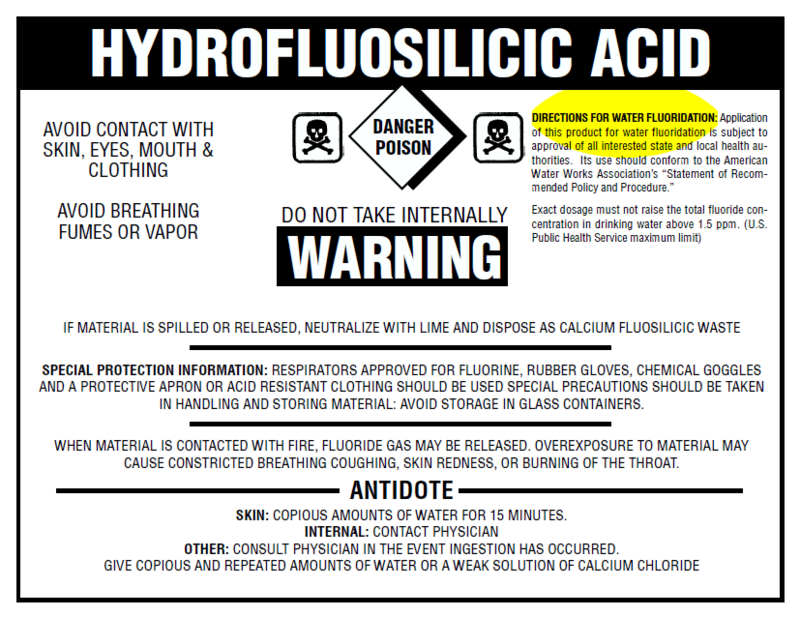 Why add Hydrofluorosilicic Acid (HFSA) to artificially fluoridate public drinking water? Hydrofluorosilicic Acid contains inorganic silicofluoride/fluorosilicate. It also contains trace amounts of contaminants such as lead, arsenic and mercury. When did lead, arsenic, and mercury become safe to drink over a lifetime, at any concentrations? Hydrofluorosilicic Acid has yet to be proven safe for systemic ingestion (i.e. swallowing) or even effective at reducing dental caries (i.e. reducing decayed, missing, filled teeth). Why would we ever want to continue dumping these contaminants (i.e. hydrofluorosilicic acid) into our clean, fresh drinking water? In April, 2,000, the Palm Beach Dental Director, Robert Dumbaugh, found himself in a dilemma in his push to fluoridate the drinking water of the small town of Wellington. When local activists revealed that the product used to fluoridate is, in reality, captured pollution from the production of phosphate fertilizer, Thomas Reeves, the US National Fluoridation Engineer, remained silent on the issue, refusing to answer any questions about the origin of the fluoridation agent. An obviously worried, Dumbaugh emailed the Palm Beach County Pollution Supervisor, Frank Gargiulo, copied to Gargiulo’s subordinate, Darrel Graziani and prominent pro-fluoridation lobbyist, Michael Easley, at the University of Buffalo. By June, arrangements had been made for Dumbaugh and Darrel Graziani, to spend a day on an educational visit at the Cargill Fertilizer Inc. phosphate fertizer complex at Riverview, Florida. Subsequently, after one field trip and reviewing some information, Mr. Graziani became Palm Beach County’s resident ‘expert’ on the pollution effluent used to fluoridate drinking water. Under an odd Florida law, pollution is not considered to be pollution until it reaches the environment. Using this device, Graziani declared, before a Wellington forum held on July 19, that the recovered pollution was indeed a ‘product’ and therefore was not pollution. “In reality, the questions pertained to known carcinogens in the fluoridation agent such as Arsenic and Beryllium which are cumulative and Group 1(a) carcinogens (known to cause cancer in humans). “Tom: I have a copy, but I’d like you to talk with Darrel Graziani, P.E. who went to Cargill with me and take a look at the slides. It will be fine with him. He also has an FSA production flow chart which would be helpful in your presentation. The presentation would be designed to refute Glasser’s allegation that FSA is toxic waste that is recovered from pollution scrubbers. So, during the one day field trip to the Cargill Fertilizer facility, Graziani and Dumbaugh had managed to redefine the nature of FSA pollution effluent! However, the US Environmental Protection Agency has a different view of the captured pollution. In 1999, the EPA established that all facilities producing phosphate fertilizers in the United States must use the maximum achievable control technology (MACT) to reduce emissions of hydrogen fluoride, and heavy metals, including arsenic, beryllium, radionuclides, chromium and lead, as well as methyl isobutyl ketone. Many of the hazardous air pollutants (or air toxics) released from the production of phosphate fertilizer are known or suspected of causing cancer or other serious health effects in humans and animals. EPA’s action was estimated to reduce emissions of hazardous air pollutants by about 345 tons annually, representing approximately 57 percent reduction from current levels. National Sanitation Foundation International, which “certifies” the fluoridating agent, stated in correspondence to Florida Department of Health administrator, Pepe Mendez, that because of the EPA’s proposed new guidelines for Arsenic levels in drinking water, there might be “more product failures” due to inherent arsenic in the fluorosilicic acid. They also stated that beryllium was also a problem. Both beryllium and arsenic are Group 1(a) substances or known to cause cancer in humans. Scientists have found that arsenic is responsible for causing, prostate, bladder, kidney, liver, skin and lung cancers in humans. Beryllium is considered the only verified causative of osteogenic sarcoma, and the EPA’s maximum contaminate level of Beryllium allowed in drinking water is 4.0 parts per billion. Both, arsenic and beryllium are cumulative toxicants in the body. Lead, a neurotoxicant, is also present in the fluoridating agent. It, too, is a cumulative poison. While heated arguments continue about the fluoridation of drinking water, the revelations about the product used in fluoridation schemes are causing much consternation among the proponents. This is evidenced by the email exchanges between top level fluoridation proponents as they frantically attempt to sanitize the toxic pollution soup. However, as much as they try, the reality is stated in the EPA air pollution regulations. They show the National Fluoridation Engineer, Thomas Reeves, trying to turn a pollution scrubber into a “product recovery unit.” It was a matter of semantics because the product being recovered was pollution. Meanwhile, Thomas Reeves and Darrel Grazani were aware of another nasty little carcinogenic secret about the toxic soup. While everyone was conspiring to sanitize the pollution soup, Graziani was in possession of a 1998 letter and analysis results for radium and uranium levels from Cargill lab manager, Mike Wells to Reeves. The accompanying lab results from Thornton Laboratories of Tampa, Florida stated that the sample contained up to 3.0 parts per million of uranium. Interestingly, other contaminants which are not carcinogens are listed at levels as low as 2.0 parts per billion while the level of uranium is 1.5 thousand times that amount. The more frightening aspects of the uranium and its decay rate products is that a “half life” means that one-half of the radionuclide decays to the next product within a given amount of time. In other words, when we are talking about Polonium 210 (or whatever) lasting for 138 days (or whatever), what actually happens is that after 138 days (one half life), half of the polonium will have changed to something else, but half will still be there. After another half life, it will be down to a quarter activity, and after another half life it will be down to an eighth – i.e. – decreasing by half with each half life; consequently, radionuclides are the poison that keeps on poisoning in ever diminishing amounts. In March 2000, Jane Jones, campaign director of the National Pure Water Association, UK, wrote to Mr. Thomas Reeves, the U.S. Chief Fluoridation Engineer, asking him to confirm or deny that the fluoridating agent is pollution scrubber liquor and to provide Safety Testing Data for the product. To date, none of the above mentioned enthusiastic promoters of fluoridation have responded to Jane Jones’ query. Despite the semantics, – “Product Recovery Unit” or “Air Pollution Scrubber” – the end product remains the same: it is a concentrated soup-mix of Hazardous Air Pollutants. Neither Darrel Graziani, Thomas Reeves nor the Grand Poopah of drinking water fluoridation, Michael Easley can transform toxic pollution into a beneficial nutrient. STOP PRESS. Now, the British Fluoridation Society in the UK is using Tom Reeves’ “product recovery unit” spin, but they cannot provide the names of manufacturers of “product recovery units”, not have any idea of how they operate! The BFS is funded by the UK Dept. of Health to promote water fluoridation and purport to be “experts” on all facets of drinking water fluoridation. The information on their website re product recovery units is deliberately misleading to the public – the taxpayers themselves. Even the Davis County residents who voted for water fluoridation two years ago should be happy that opponents are close to forcing the issue back onto the ballot this fall. The additive most people assumed they would be getting — the pharmaceutical-grade sodium fluoride found in toothpaste, pills and dental treatments — is not the stuff flowing from taps today in the county’s southern end. Instead, the Weber Basin Water Conservancy District took a more economical path and bought fluorosilicic acid. Those who had visions of sterile white laboratories when they voted for fluoride weren’t thinking of fluorosilicic acid. Improbable as this sounds, much of it is recovered from the scrubbing solution that scours toxins from smokestacks at phosphate fertilizer plants. Water fluoridation has turned a tremendous hazardous-waste disposal expense into a multimillion-dollar profit for fertilizer manufacturers. Now stop and think about the nonsensical mechanics of that scheme for a moment: The Environmental Protection Agency wouldn’t allow a bucket of this stuff to be poured directly into the Great Salt Lake, yet many tons will flow there in coming years via Davis County wastewater alone. As long as some of it passes through people first, the EPA rules against dumping waste are suspended. The amount that reaches your water tap is relatively small, about about 1 part per million (ppm), yet it’s worth noting that the EPA’s limit for lead in the water is only 0.015 ppm — and lead is less toxic than fluorosilicic acid. Arsenic is only a few times more toxic, yet its EPA water limit is about 400 times smaller than the acid’s. Fluoridation proponents call such comparisons irrelevant because they say the acid has been used for years with no proven ill effects. But they can’t provide more than this anecdotal assurance because fluorosilicic acid — unlike the fluoride in your toothpaste — has never been subject to serious toxicological study by the government. The EPA’s ranking chemist confirmed that mind-boggling oversight to The Tribune last week. politicos can do is tell you, “Other cities have been using it for years.” That, folks, is not science. If you voted for lab-tested fluoride and not some factory’s toxic swill, you should thank opponents for hanging with this issue and giving you another chance to choose.